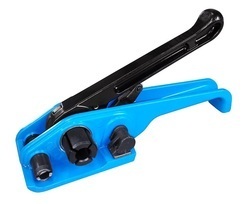 Our range of products include manual strapping tensioner tool and strapping tensioner tool. We are the remarkable entity, engaged in offering high-quality Manual Strapping Tensioner Tool to our clients. The offered tool is manufactured by our vendors’ professionals in line with industry quality standards from the finest quality components and ultra-modern technology. So as to ensure flawlessness, this tool is tested on different parameters. Used to tension, seal and cut strapping and that too without seals, provided tool can be custom designed in order to cater to the requirements of the clients. We are remarkable entity, engaged in offering high quality Strapping Tensioner Tool to our clients. The offered tool is manufactured by our vendors’ professionals in line with industry quality standards from the finest quality components and ultra-modern technology. So as to ensure flawlessness, this tool is tested on different parameters. Used to tension, seal and cut strapping and that too without seals, provided tool can be custom designed in order to cater the requirements of the clients.